Silver_Stardream_Envelopes is rated 4.9 out of 5 by 10. Rated 5 out of 5 by Sarasez from Very responsive Called about wrinkled envelopes due to postal mishandling and was immediately told to toss them! And got a new delivery in 3 days in a much heavier box! Rated 5 out of 5 by Calilala from Perfect I needed a few things to complete Feng Shuing my house and these did the trick! Do you have peel and press envelopes? We do not have peel and press envelopes in Silver Stardream. But we do have a wide variety of peel and seal strips available with our Tyvek Envelopes, Foil Envelopes, cello sleeves, and more! looking for 1500, do have that many in stock?? Yes we have plenty in stock!! Good morning, How soon would we be able to receive this order? Hello, Please call our customer service directly for shipping and transit related questions. I have posted the number below. You can reach us M-F 9-6. (201) 567-6666 Thanks! When gray is too subtle for your taste, choose Silver. When silver isn't enough, choose Silver Stardream. They don't just shine, they shimmer into the night. An envelope that shimmers like our metallic silver envelopes will let your recipients know there’s something special inside even before opening the content. 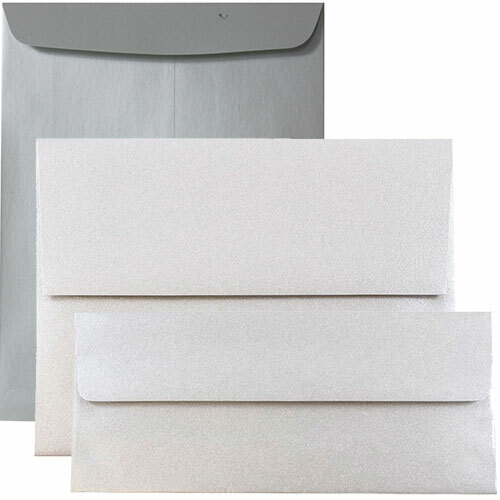 And with the beauty and shine of the envelope combined with the high quality of the envelope, you really can't go wrong. With over 15 sizes for you to choose from, there will be no trouble finding the right one for your special place card, wedding invitation, baby announcement or work presentation. Matching 8 1/2 x 11 & 8 1/2 x 14 80lb Silver Stardream paper and 8 1/2 x 11 110lb Silver Stardream Cardstock is available.